Jean-Michel Basquiat and Jennifer Goode, c. 1985. Keith Haring and Dolly Parton, 1985. Given how much he is still with us, it is hard to believe that Andy Warhol died 25 years ago. Yet the quarter of a century since his death has only affirmed his artistic genius and prescience. With his paintings now iconic emblems of twentieth century art and his aphorisms and insights now a part of the vernacular it would seem there are few stones in Warhol's oeuvre left unturned – yet his photography remains one of the least known aspects of his work. This is ironic given how much of Warhol's work was photo based. And as Warhol told an interview in 1963, "The reason I'm painting this way is because I want to be a machine". 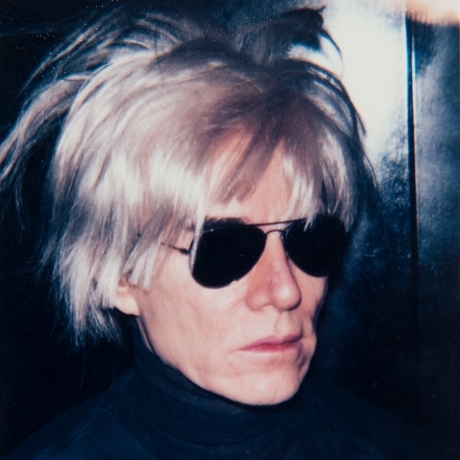 In Warhol's photography – he became the machine. His photographs present an opportunity not only to see how much he experimented with medium and form, but to understand the vast range of his interests – from the biggest stars to the handsomest boys to the most mundane objects. Most surprisingly, in the world of multiples that was so much Andy's world and vision, the photographs are nearly always unique. Whether taken in a photo booth, or with a Polaroid, or printed from 35mm negatives, Warhol never editioned or re-printed his photographs. The exhibition - "Andy Warhol: Photographer" comprised of 143 unique prints is the first gallery show to focus on all the varieties of Warhol's photographic output. Warhol's photographs always were things. While his choice of camera—the Polaroid or the latest 35mm point-and-shoot—belied his interest in jettisoning any technical proficiency (in the same way that the screen-print neutralized the mastery of the brush stroke), Warhol was first and foremost an artist who relied on the camera as a personal recording device. If his paintings largely repel the human presence, his photographs solicit and revere them. The famous myth about Warhol claiming that he wasn't even in the factory studio when many of his canvases were produced smoke-screens an artist who relied heavily on human contact, who in a sense needed his eye to be present and engaged so much that he often called the camera strapped around his neck his "date" at parties. Warhol's notorious cult of personality traded on his being there, on valuing his own perspective, on the root or constructed character of his subjects, which he glamorized, lampooned, or heroicized based on his own evaluation. Warhol's own photographs undermine the popular notion of Warhol as blank agent. The Hedges Collection of Andy Warhol photographs covers the range of Warhol's output – from photo-booth portraits to stitched photographs - but it is composed primarily of two distinct inventories of photographic prints. The first are his iconic color Polaroids of celebrities and society figures. The second, lesser known group are the black-and-white 8x10s that are almost diaristic in proposition, detailing personal trips and intimate encounters. Together they etch with dramatic dimension a side of the artist that is still being explored. Of the former, these close-up, background-free, unremittingly direct portraits of the period's bold-faced names are often misrepresented as mere source work for his screen print portraits (which were Warhol's bread and butter throughout the 1970s and 80s). Among the seductive role-call of celebrities found here are John Lennon, Sylvester Stallone, Carolina Hererra, Dennis Hopper, Liza Minnelli, Diana Ross, along with New York City trannies, and even somber, black-shadowed Polaroids of Warhol himself. To be sure, Warhol's endless intrigue in the pomp and power of fame gets full play here. Each subject is wrenched out of time, existing in a perfect white vacuum almost reminiscent of imperial Roman busts. In one sense, each individual shot is a fetishistic prize, a compendium of desire, adulation, allure, which gives a sexual frisson in owning and observing this piece of fame. At the same time, Warhol starkly manages to humanize each sitter, reducing him or her to size, weeding out the elaborate trappings of the limelight until there is the haunting sense of a showdown between the persona and the candid mortal staring into Warhol's lens. As in all of Warhol's best work, the mix of building up and breaking down, of humor, sorrow, and transience infiltrate these portraits. If several of these Polaroids were ultimately used as the basis of screenprint portraits or Interview Magazine covers, it is these final painterly renditions that are ultimately reproducible, endlessly repeatable, and easily disseminated. The single Polaroid with no negative from which to reprint alone exists as the un-reproducible piece in the process. These stand-alone images represent Warhol at his most tangible. He is there, on the other side of the camera, inches from his sitter, plying and encouraging and finding his own judicious angle. Warhol was one of the most ravenous social animals of the second half of the 20th Century. It is nearly impossible to strip his artistic contribution from the whirlwind of clubs, connections, factory goings-on, and a protracted longing to be at the center of the social storm. The second half of the collection, the black-and-white 8x10s shot on various point and shoot cameras, covers much of Warhol in motion, a roving inquisitor of the 1970s and 80s scene he largely birthed. In several shots, Warhol can be found sidling up to Yoko Ono, or Martha Graham, or Truman Capote. Not enough can be made of his hungry obsession, documented in these reportage-style shots that would become a provocative photographic style of its own in art and fashion decades later. But alongside these public displays are frozen deeply personal moments, where the camera catches the trajectory of Warhol's emotions, love and beauty, romance and friendship. These photographs are startling accents in the Warhol vocabulary, as much for their sentient aesthetic as for the humanity that underwrites them. One shot of a beach in Montauk, where the artist kept a second home, revels in the sporadic pattern of footprints, as if the image functions as a corollary to his famous painting of calibrated dance diagrams. In another, a translucent lingerie nightgown hangs from clothespins and sways mournfully in the wind. Several images glimmer Warhol's hope for love, whether indirectly by way of the historic Paramount Pictures archway, which to the abstract audience could be read as Warhol honoring his beloved stars of the studio system, or for the knowing, a silent tribute to his boyfriend Jon Gould, who worked there; or directly, in the shape of a heart scooped out of the snow on a skiing trip in Colorado and framing Gould who seems to be walking away from the emblem. These photographs are not the work of a disinterested mind who felt that making art required merely pressing a button. They showcase a furious, poetic eye who knew that a camera could celebrate the famous and also preserve the simple, silent corners of the world where a real interaction could be made.